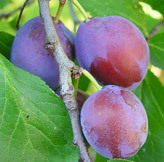 Over 2,000 varieties of plums exist, each with a diverse set of shapes and colors, and they are divided into the following six categories – Japanese, American, Ornamental, Damson, Wild, and European. Japanese plums are the most familiar and widely sold fresh-eating plum. They are round or heart-shaped with a dark red or peachy-yellow flesh. Though the fruit originated in China, it was the Japanese who began to cultivate and further develop this particular variety, thus winning naming rights. The European varieties were discovered 2,000 years ago and tend to be smaller and more oval in shape and are commonly dried and used to make jams and jellies.